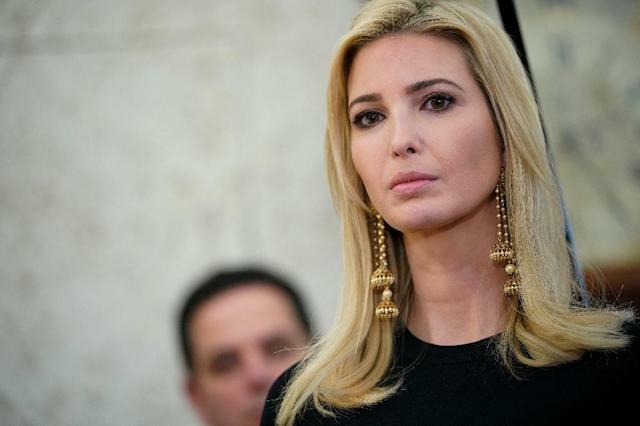 Washington (AFP) - Ivanka Trump will lead the US delegation to the closing ceremony of the Olympics in South Korea on Sunday, the latest high-profile visit to Winter Games that have been a hotbed of geopolitics. The White House said Donald Trump had asked his eldest daughter -- who is also one of his top advisers -- to travel to Pyeongchang to lead up a "high level delegation." The 36-year-old businesswoman and model-turned-policy-advisor will be joined by press secretary Sarah Sanders and is going in part because "she is something of a winter sports enthusiast," an official said. A senior administration official ruled out any possible meeting between Ivanka and officials from North Korea. For ten days, as athletes have competed on the slopes, rinks and runs, North Korea and the United States have used the Games to try and shape public opinion. The two nuclear powers are locked in a standoff over North Korea's nuclear and ballistic missile programs, which could soon threaten the continental United States. Visitors to Pyeongchang included Vice President Mike Pence as well as North Korea's ceremonial head of state Kim Yong Nam and Kim Yo Jong, the telegenic sister of leader Kim Jong Un. The Games' opening ceremony saw Pence and the North Korean representatives seated in the same box, but they did not interact. They had planned to meet secretly while in South Korea, but US officials said Pyongyang scrapped the plan after Pence denounced North Korea's "murderous regime." Pyongyang has used the Games to try to soften its image and push for talks with Seoul that could cut the odds of a US military strike. Meanwhile Washington has tried to project resolve in the face of a growing nuclear threat and repeatedly tried to underscore the importance of a troubled alliance with Seoul. Ivanka Trump is scheduled to meet South Korean President Moon Jae-in on Friday, another salvo in that diplomatic back-and-forth. "The upcoming visit by adviser Ivanka is intended to celebrate the successful hosting of the Pyeongchang Olympics and highlight the mutual understanding of the South Korea-US alliance," Noh Kyu-duk, spokesman for the foreign ministry in Seoul, said Tuesday, according to the Yonhap news agency. The distance between Seoul and Washington was laid bare in a meeting between Moon and a North Korean delegation, during which Kim Jong Un's sister passed on his invitation to visit Pyongyang for a summit. Despite that, Washington has said it will maintain its campaign of "maximum pressure" on Pyongyang.